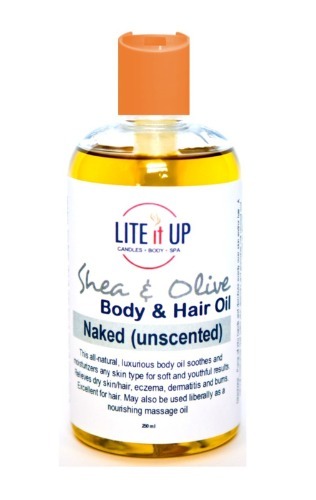 SHEA & OLIVE Body & Hair Oil - Naked (Unscented) - 8oz - Lite It Up Corp. This all natural, luxurious body oil soothes and moisturizes any skin type for soft and youthful results. Relieves dry skin, eczema, dermatitis and burns. May also be used liberally as a nourishing massage oil.